All-cor anglais recitals are not common; never mind ones that are this generous. In fact I cannot think of any others. I recall Rubbra’s sombre Duo for cor anglais and piano. It was on Etcetera ETC1074 but had to share the disc with various sonatas for the dominant member of its double reed family, the oboe. It’s no wonder that Peter Bree included the Rubbra on that disc – he was, after all the dedicatee. Now along comes this concert which mixes longer and shorter works in the hands of the GSMD professor and musically eloquent player Alison Teale and pianist, RCM professor Elizabeth Burley. It’s not quite the frills and fritillaries anthology I had expected. For a start there’s some gloriously woody staccato in the Ritual Fire Dance as well as great control of dynamics not to mention the seductively carolled Pantomime. The latter is a gift to any legato-capable instrument and Teale caresses each moment to loving effect. The Valentine is all clean-limbed and dignified baroquerie. The Messiaen Vocalise was written for voice and piano and dates from 1935. It’s sultry Debussian stuff and by no means as adventurous or as potentially forbidding as the rest of this composer’s output. Burley is magnificent in treading that vital line between velvet murmur and keyboard percussive. The extremely demanding, virtuosic and lyrical Snake by Berkeley was inspired by the D H Lawrence poem. It’s an unaccompanied Britten-like work yet human and yielding. Its punishing demands on the lungs are apparent in the intakes of breath. The Ravel movement has been very effectively extracted from the concerto. It is interesting to hear the principal roles swapped here between the two players. The Piazzolla is dextrously and alluringly despatched. The darkly occluded Rubbra piece is a late work – suffused with drama and the slow blossom of song. Its nocturnal clouds and shafts of light recall the same composer’s Soliloquy for cello and orchestra. The sometimes coruscating dissonant heroics of the Luchetti precede the short and rather Gallic Bozza Divertissement. The six-movement Hindemith sonata was written in the USA in 1941. It was flanked in time by the trumpet sonata and the horn sonata. A plangent and cloud-hung piece, the cor anglais intensifies rather than merely voices the mood. There’s humour as well as you will hear from tracks 17 and 19. The Saint-Saëns is kept in motion rather than dawdled over. The Pasculli is an adaptation of the aria from Verdi’s Un ballo in Maschera – at first the last word in theatrical drama but then melancholy before a final jaunty Weber-like flurry. Gordon’s Bebop tango jazzily smooches and races. It’s been adapted by the composer from a track on his CD Angel feet. It would be good to hear Teale in some out-of-the-way concertos. How about Anthony Burgess’s Cor Anglais concerto? Sounds like a Dutton project to me. The insert notes that she has already performed numerous concertos for Radio 3 and has taken the shared principal role in Copland’s Quiet City with Alison Balsam. The 16-page full colour insert unfolds to reveal a large image of a cor anglais. I am none too sure about the choice of poster as against booklet but as a poster of an intrinsically beautiful musical instrument it certainly works. 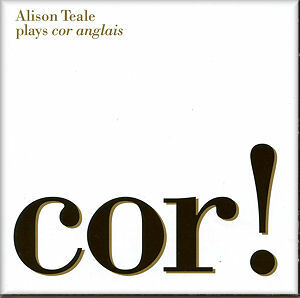 Alison Teale proves herself a virtuoso of the cor anglais in terms of both excitement and poetry. This disc should win new friends and future champions for the instrument.